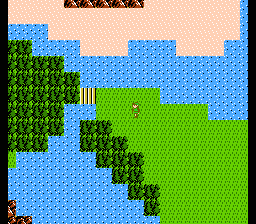 This fairly inventive and unique Zelda II hack was created by the_icepenguin , or Seferaga as he is known on GameFAQs. Although I have no personal in-depth knowledge of this hack, I have done my part and tried it out. First impressions: very hard. 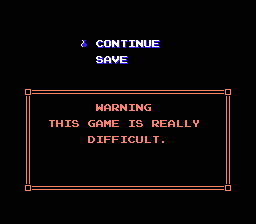 The continue screen assured me, it just wasn't my low skill level hindering me in this modification. The sad part about this was I was using the Easy (now the Medium version in 1.8+) version of the hack. Yes that is correct, there is three separate patches available in the download. Here's some information about what the differences are in the easy and hard modes taken from the read me . Some magic costs less MP. the game. Go check it out! The Up and Down stabs are in this version. Some magic costs more MP. I added a fun secret to ONLY this version but I'm not going to say what! You will like it though, once you see it. The Up and Down stabs are NOT in this version. 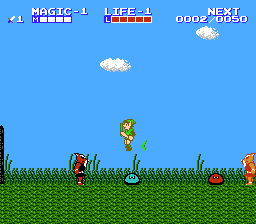 To my knowledge there is no new graphics available in this hack, although almost all gameplay is altered so it will feel like a new game anyway. Coincidentally ocw, who has helped me with some corrections on this site was the bug tester for this hack. Eventually I might come back and work my way through this modification, it looks really challenging. You will need an ips patcher to patch your rom with this hack. The newest version of this hack (v1.9) corrects some serious bugs that was making players become stuck permanently in some palace walls. View the documentation/read me here .